Andrew Wyeth said: "I love to study the many things that grow below the corn stalks and bring them back to the studio to study the color. If one could only catch that true color of nature - the very thought of it drives me mad. " Andrew Wyeth was born July 12, 1917 in Chadds Ford, Pennsylvania. He was the youngest of five children. Andrew was a sickly child and so his mother and father made the decision to pull him out of school after he contracted whooping cough. His parents home-schooled him in every subject including art education. Newell Convers Wyeth (Andrew's father) was a well known illustrator whose art was featured in many magazines, calendars, posters and murals. He even painted maps for the National Geographic Society! Andrew had a vivid memory and fantastic imagination that led to a great fascination for art. His father recognized an obvious raw talent that had to be nurtured. While his father was teaching him the basics of traditional academic drawing Andrew began painting watercolor studies of the rocky coast and the sea in Port Clyde Maine. 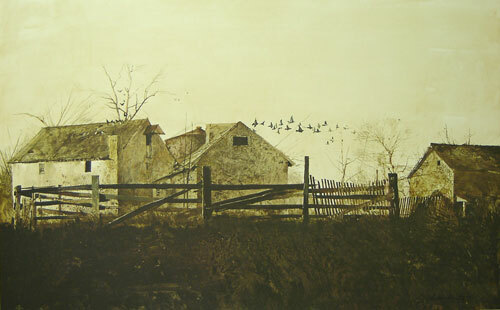 Wyeth worked primarily in watercolors and egg tempera and often used shades of brown and grey. He held his first one-man show of watercolors painted around the family's summer home at Port Clyde, Maine in 1937. It was a great success that would lead to plenty more. 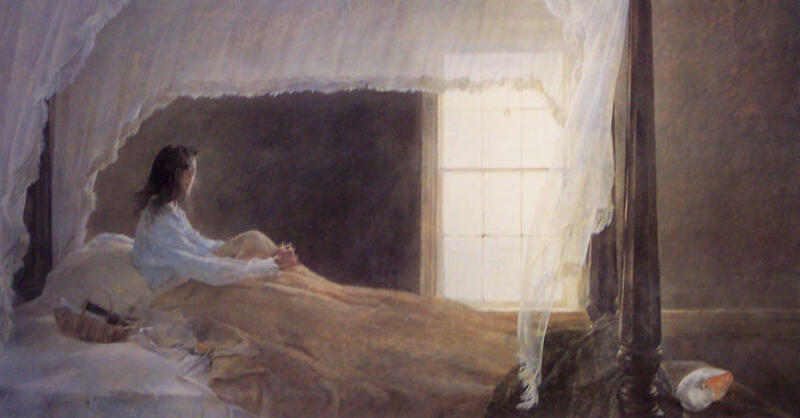 Wyeth married at the age of twenty-two to a local girl named Betsy James and had two boys, Nicholas who became an art dealer, and James who became the third generation artist in his family. Interestingly, although James' father was the most popular artist in his family history, he was greatly inspired by his grandfather's illustrations. 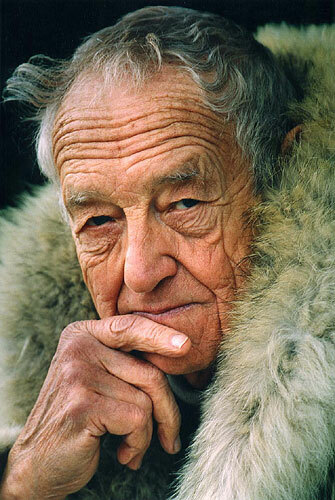 Wyeth was featured on the cover of American Artist as well as many other famous magazines such as the Saturday Evening Post that displayed his painting "The Hunter." His first solo museum exhibition was presented in 1951 at the Farnsworth Art Museum. Since then he has seen many more successes and is considered one of the most "collectable" living artist's of our time. 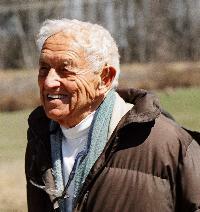 On January 16, 2009, Andrew Wyeth died in his sleep at his home in Chadds Ford, Pennsylvania, after a brief illness. He was 91 years old. Frame shown is representational. Please request picture of framed print to see more exact framing.